rating: 2.5/5 [in the genre] or 4.5/10 [all books I’ve ever read]. recommended for: Fans of fairy tales of all kinds. People who enjoyed The Orphan Queen by Jodi Meadows, Shiver by Maggie Stiefvater, or the Grisha trilogy by Leigh Bardugo. will i read this author again? : Yes, because I still love her. Read my review of Cruel Beauty and you'll understand how much I admire Rosamund Hodge and adore her writing. I still do; for that reason, perhaps, Crimson Bound was a disappointing read for me. It contained so many delightful elements that attest to Hodge's creativity and flair: an original and thoughtful mythology, a feisty female lead, a multi-layered plot. However, these elements existed in Cruel Beauty within a tightly plotted scaffold. The rambling and unfocused plot of Crimson Bound prevented me from truly latching onto the brilliant parts. After a promising start, the book seemed to move alternately too slowly or too quickly, jerking forward in leaps that tested my credulity and confused my sense of coherence. Frankly, I often felt bored. Only for moments could I peer beyond my unenthusiasm and appreciate the unique characters, clever twists, and beautifully atmospheric writing. 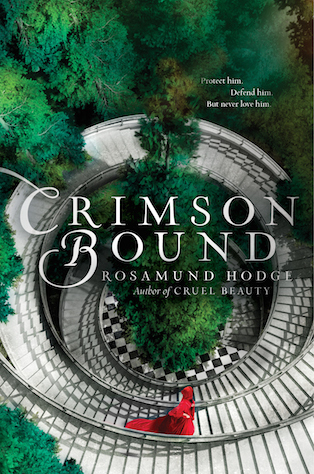 I'll hope for Hodge's third to wow me again, but Crimson Bound will stick in my mind as a frustrating knot of unmet potential. As with Graceling, I can only wonder if I missed something. Lucky for you, reader, I appear to be rather alone in my assessment, since Goodreads is aglow with praise. So check it out--but if you too find yourself bored, turn your sights to Cruel Beauty. The plot was a clever undertaking suffering from inelegant execution. So I'll rate the content highly, but it's the mechanics, the craft, of it that ruined it for me. All of the fascinating elements are there. We begin with a young girl hopeful to save her world at any price. Her fervor lands her in the clutches of a devious forest creature. A time jump later, that girl is Rachelle, supernatural creature in service to the king as penance for her mistake. When Rachelle's forest-bound maker warns her that the apocalyptic forest deity is returning, Rachelle knows that her only chance to stop the world's end is an ancient sword. 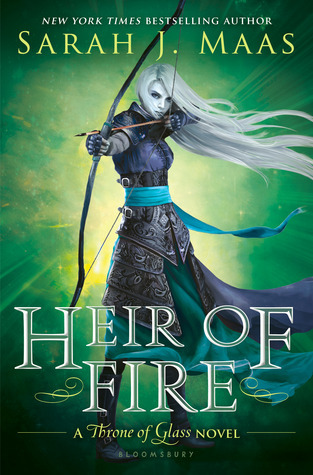 Her plans to find it are frustrated when the king orders her to guard Armand, the handless saint who tangled with the forestborn demons--and lived. Rachelle must navigate her distaste for Armand, a web of court intrigue, a devastating coup, and invisible enemies to find the sword and destroy the evil Devourer god. Great, right? It would have been, except that it wasn't. It just felt so incoherent. Bits seemed to be thrown in at unexpected times for no apparent reason; seemingly important parts were glossed over. Some of the motivations felt thin or inadequately explained. While there are plenty of great twists near the end, they're sadly overshadowed by what precedes them. The episodic feel of the plot would have made an interesting television show. In book form, it was a confusing string of events wrapped around a lackluster romance. I adored this concept, which is perhaps why my thoughts about the plot are so harsh. The comparison to Red Riding Hood could have been downplayed a little in marketing, considering it's largely worn out after the first chapter, but it was a delightful twist on the wolf and the forest. The reimagining of The Girl with No Hands was more pervasive, and more interesting. Armand was known as a saint to the people. He'd been marked by a forest demon and forced to the choice: kill or die. He chose death, but survived anyway--except for his hands, the forestborn's price for disappointment. His sainthood reminded me of Alina's in the Grisha series, except that it was underplayed so much here. What Hodge did execute fabulously was her mythology. She invents for us a medieval Frankish nation in the shadow of the Great Forest, a placeless, primitive otherworld existing parallel to our world--and trying to force its way in. This is the home of the supernatural forestborn demons. Of the Devourer, a Cthulu-like old creature who once plunged the world into darkness. Of Zisa and Tyr, mythical figures with bone swords who ruthlessly brought the world back into the light. I'd read a book on the mythology alone. The parts concerning this mythology were the best in the book, and definitely redeemed some of the slow plotting. I loved the characters in a way, but many of them felt like shells. Rachelle was given the most space to grow, of course. Despite her constant whining and self-pitying, I liked her. She truly regretted her past and hoped for penance. She struggled with her past in a way that becomes poignant and complex as the story goes on. She was also bold, brash, and confident in a way I admired. As usual, I loved the rakish Erec, and particularly the way his character grew over the book. I also adored La Fontaine, Armand's coquettish cousin. She's lovely and fascinating. She's openly the king's mistress. She lives in a half-believed fantasy world of her own making. She's catty and delightful. Much more than her cousin, Armand. For a love interest, he felt thin. I would get glimpses of his personality--long suffering, trapped, secretly sharp--and then lose him a second later. I never quite understood his motivations until it was too late. Amelie, too, felt thrown in. Why was she so bubbly? Why did she think she'd be allowed to come to the castle? Give me more! Perhaps it was Rachelle's voice distracting me, but I didn't like the writing style in this book as much as in Cruel Beauty. Not on the whole, anyway. There were plenty of parts that were truly gorgeous, as only Hodge can do. She has a way of telling a story in simple language that becomes ornate over time, like an old-world master storyteller. Truly, you get the feel of a fairy tale from her language. Her dialogue is also generally sharp. There was one amazing scene in La Fontaine's garden that reminded me so much of Oscar Wilde. It was full of quick, irreverent banter and it did more to characterize the main players than most scenes before or after. However, there were also less pretty bits, and I think I'd have thrown the book at the wall if I had to read one more variation of, "This was happening, but she couldn't think about that, because she needed to focus on Joyeux." Yes, we get it! You need to get the freaking sword! Thanks for the 35th reminder! That said, Hodge can turn a pretty phrase, and she shows it well here. Pacing is key to keep up the tension and interest in a book, and it just flopped here. Most of the scenes felt like a jumble, and the spaces between them either raced or dragged. It was jerky and confusing. The first half dragged along, more full of Rachelle's musings than actual happenings. Her resolution to find the sword was so quick that I almost missed it, and then there are a few chapters of spats with her partner Erec and fights with dangerous woodspawn creatures. Then she's ordered to the castle where, luckily, the sword might be found. Then she's saddled with Armand. You know, the "person she hates most"? Except she's never met him before! Really, it's more that she comes to dislike him for a bit--except that then suddenly she wants him, then an instant later she loves him, then another nanosecond later he loves her too. Then there's a coup suddenly with the barest foreshadowing, except it goes away almost instantly and everything's fine again. But it's not fine! Time to find the sword again. And have a few fancy parties. Then we get to the best part of the book, where loyalties are revealed and there's all sorts of lovely deception, fighting, and mythology. Then it ends, sort of, after a while of C.J. checking her watch. Crimson Bound has the trappings of a classic fairy tale, with a sweet love story, dangerous intrigue, and a richly portrayed mythology. Unfortunately, loose plotting and poor pacing derail an otherwise clever premise.